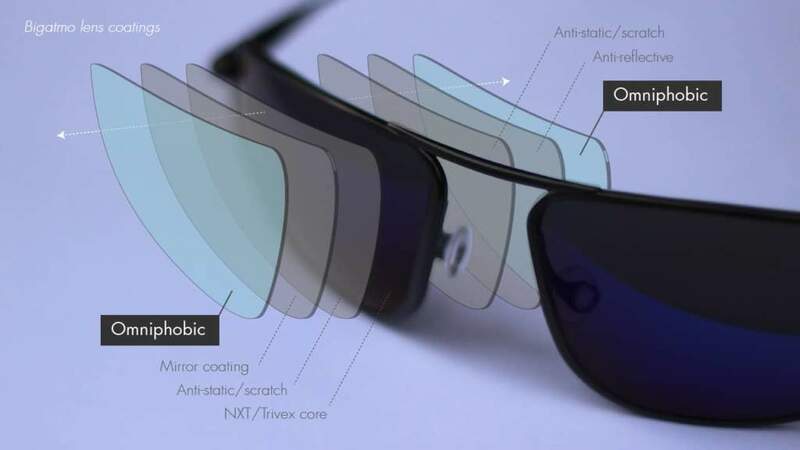 Bigatmo’s core NXT® lenses are enhanced by a series of industry leading lens coatings and treatments resulting in truly outstanding performance. All Bigatmo lenses have an omniphobic treatment applied to both the front and the back of the lens. This coating quickly disperses water, sweat, make-up and suntan lotion, so lenses are not only easier to clean; they also stay cleaner for longer. Light reflecting off the back of the lens is irritating, dramatically reduces clarity and can result in up to 5% of available UV light entering the unprotected eye. An industry leading 8-layer anti-reflective coating is applied to the back of all Bigatmo lenses. To exclude as much light as possible entering from the rear of the lens, Bigatmo frames have a 23˚ wrap with a curved lens that hugs the contours of the face. 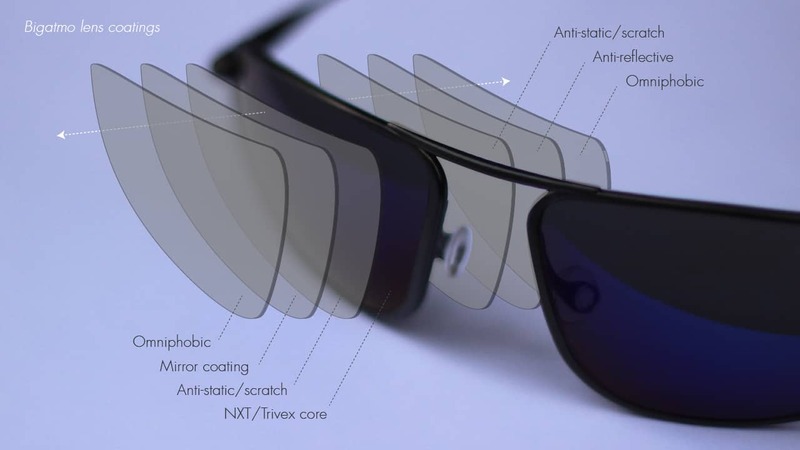 In conventional sunglasses the curved lens can distort the periphery of the image and make objects appear out of position; Bigatmo lenses use optical decentring to overcome this problem, meaning that objects remain in position and the image stays sharp. 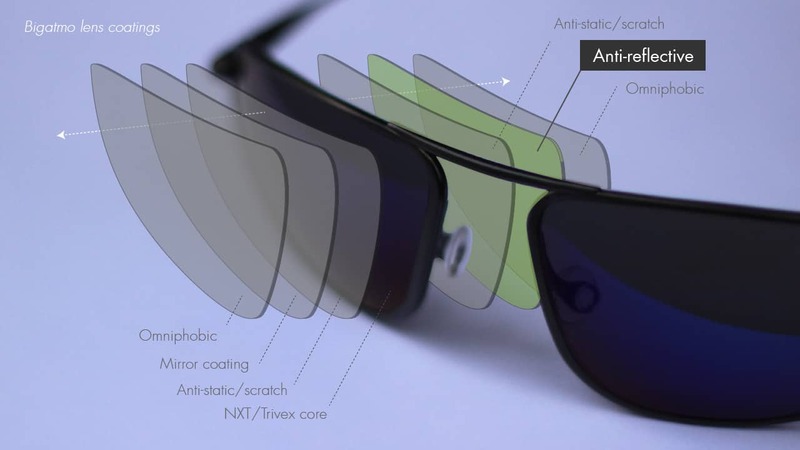 All Bigatmo lenses incorporate high quality anti-static and anti-scratch Quarz® layers. 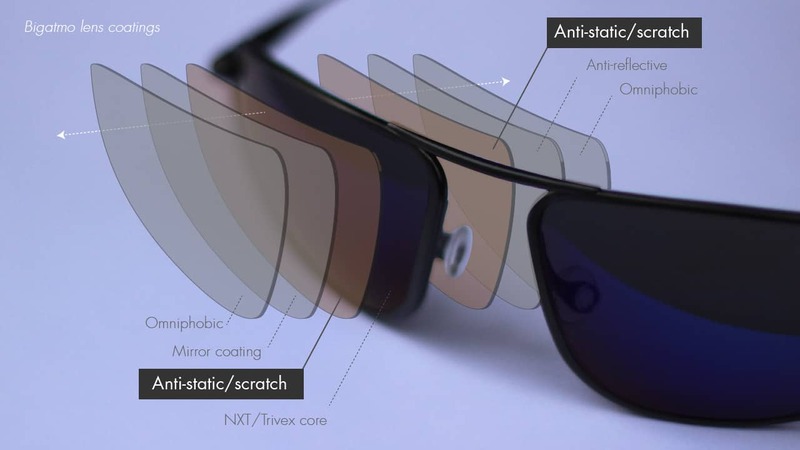 This provides superior scratch resistance which helps to make Bigatmo sunglasses extremely durable and long lasting. Bigatmo sunglasses can be customised with a cosmetic mirror finish that looks great and allows the lens to perform as it was designed to. Our standard mirrors are made from multi-layer dielectic coatings which don’t interfere with any of the lens properties and provide a light, subtle finish to our sunglasses. Conversely, our Bigatmo gradient mirrors use a more traditional chromium compound on the top half of the lens to reduce light transmission. This reduces extreme glare from above whist retaining the lens properties below, making them ideal for high contrast environments such as driving or flight deck conditions. 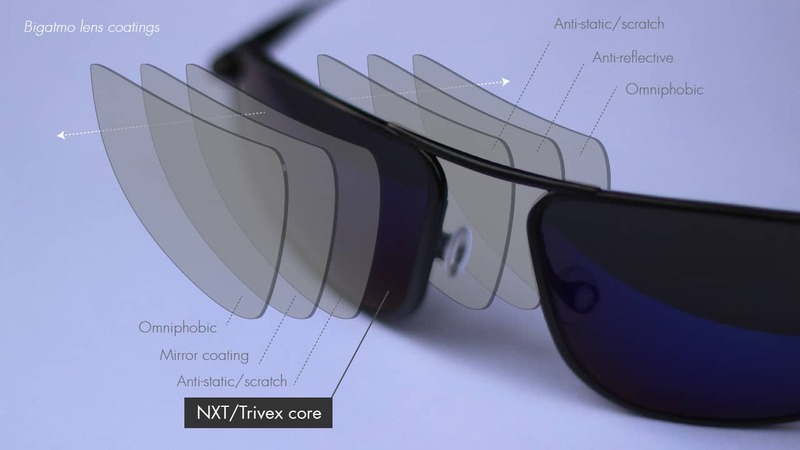 Every Bigatmo lens is made from NXT/Trivex®; the optical polymer used in bullet proof military helicopter screens. 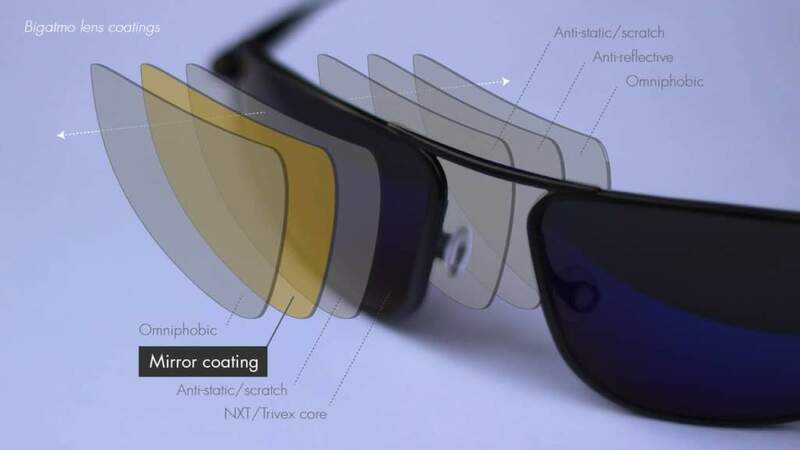 Colour tints and patented active technologies are incorporated directly into the material, resulting in three choices of lens: the Bigatmo Alutra, the Bigatmo Zeolite, or the Bigatmo Polarized.